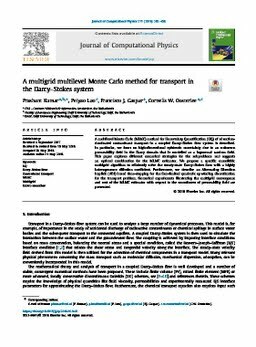 A multilevel Monte Carlo (MLMC) method for Uncertainty Quantification (UQ) of advection-dominated contaminant transport in a coupled Darcy–Stokes flow system is described. In particular, we focus on high-dimensional epistemic uncertainty due to an unknown permeability field in the Darcy domain that is modelled as a lognormal random field. This paper explores different numerical strategies for the subproblems and suggests an optimal combination for the MLMC estimator. We propose a specific monolithic multigrid algorithm to efficiently solve the steady-state Darcy–Stokes flow with a highly heterogeneous diffusion coefficient. Furthermore, we describe an Alternating Direction Implicit (ADI) based time-stepping for the flux-limited quadratic upwinding discretization for the transport problem. Numerical experiments illustrating the multigrid convergence and cost of the MLMC estimator with respect to the smoothness of permeability field are presented.